TN Game's 3rd Space Vest, designed by physician Mark Ombrellaro, is based on a earlier medical instrument that permitted doctors to carry out distance based investigations. 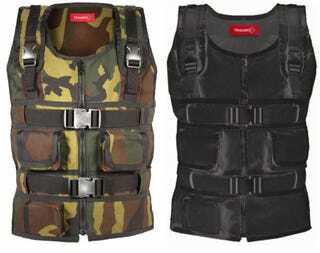 As if there could be an even better use, Dr. Ombrellaro has modified the vest so gamers will be able to feel gaming impacts, such as punches and shots, by means of alternating air pressures that will simulate the sensations. The gaming peripheral will consist of eight zones, all of which will be able to direct appropriate force to accurately simulate a plethora of sensations, including bullet fire, explosions, punches and even finger taps. The device will be released in November, retailing at $189 and will come bundled with two games, 3rd Space Incursion and a special edition of Call of Duty II. The TN Game online shop is currently taking pre-orders at $169.99 saving 20 bills on the final price post release. Patches will be made available for Quake3/4 and Doom 3 compatibility and an SDK kit will be released for developers.